Who doesn’t love a good chocolate brownie. They need to be fudgy and moist, with a good chocolate flavour and not too sweet. I also really love it when you can make a recipe and not have a mountain of dishes to clean up afterwards. So with all that in mind I set to work to find the best brownie recipe I could. Some turned out more cake like and one even ended up more like a cookie than a brownie. My littlest critics always gave me constructive feedback and I was relieved when I finally had a winner. I tried out a few different gluten free recipes but ended up modifying a normal wheat recipe to create this scrummy little treat. I used a mixture of almond meal and gluten free flour and used less than half the amount of sugar some other recipes use. 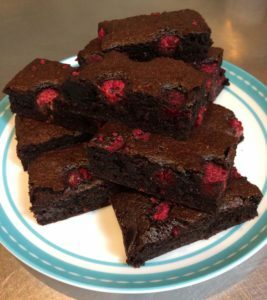 Adding extra ingredients such as lovely tart raspberries bring a whole different dimension to this brownie. I am yet to try a double (or triple) chocolate version, but I’m certain with some chopped up dark or white chocolate in it it would become a very decadent, perhaps adults only treat. 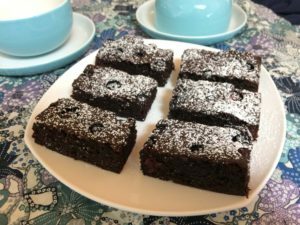 I have also noticed that as with quite a few cake recipes, this brownie is even better on the second day. The texture sort of changes and it gets more fudgy. Everyone who has tried it (and some who have only seen photos) have asked for the recipe so here it is. Whip yourself up a quick batch and enjoy! 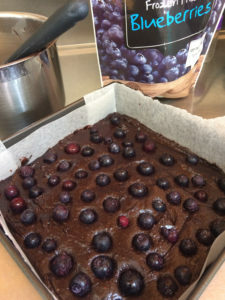 This is a delicious chocolate brownie that is easily whipped up in one pot. It can be spiced up with the addition of raspberries or blueberries, or even some chocolate chunks for a more decadent treat. Just devine! Preheat oven to 160 degrees fanbake and line a 20cm square baking tin. Add the sugar, cocoa and vanilla and mix together well, making sure there are no clumpy bits on cocoa powder. Add the eggs in and beat really well with a fork. Add the flour, almond meal and salt and combine well. Pour batter into tin and smooth the top. Add the extra fruit or chocolate on top and slightly press in. Bake for about 25 minutes until almost cooked through. Cool in the tin before slicing. Add a dusting of icing sugar if desired right before serving.